Landscapes by Land Art LLC offers landscape clean up services in Orlando and Central Florida. 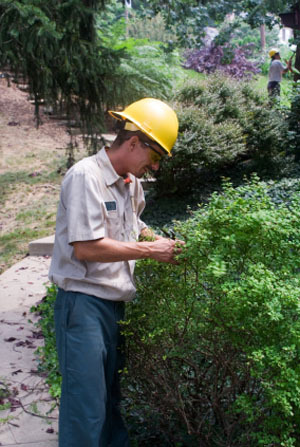 Our landcape clean up crew will remove any dead landscape material, trim hedges, prune bushes, edge crisp bedlines, and remove any debris from your landscape. We are ready to help you clean up your residential or commercial landscape to give it that healthy look that it once had. You can give your landscape a new look simply by cleaning up its existing condition. Pruning, trimming and other maintenance steps that may have gone unattended to can greatly enhance your landscape with a new, neat and controlled appearance. If your current schedule leaves no time for yard work, call Landscapes by Land Art for a one time clean-up to get things in shape. We’ll restore your area to pristine condition with our innovative techniques and skilled crews. Is it time to clean up your landscape and bring out its beauty? Our landscape clean up services can include mulching, we will Spread a 2" to 3" layer of shredded Pine bark, or mulch of your choice in all of your landscape beds. Keeping in mind that one cubic yard of bark with cover about 108 square feet of bedding area, we will provide you with an accurate cost for mulching prior to the service. If you are mulching to satisfy Orange County, Orlando or other landscape code, you must use an organic mulch. As you may know, pine bark mulch is more environmenatlly sensitive or "green" as pine is grown for timber harvest and it saves our Cypress trees from being shredded and used as mulch. Additionally, pine bark mulch is typically more cost effective than Cypress mulch in orlando and central florida. As part of our landscape clean up services we can mow your lawn turf areas, we will detail the edges of your lawn where it meets your hardscape surfaces and planting beds to provide a crisp and smooth transition. Orlando Landscape clean up crew pruning.